We’re not all lucky enough to have a sauna at home. This means that if you’re paying hard earned money to spend time in one somewhere else, you need to know how to get the most out of a sauna and get real bang for your buck. No matter the type you use – although we do love a traditional home sauna– you can follow these sauna tips and tricks to get the most out of your sessions. – Make time to get to the sauna early. If you have to bite your tongue through traffic to only just get to the sauna in time, you’ll arrive completely stressed out and in the wrong mind set for using a sauna. The idea is to feel as relaxed as possible, so give yourself plenty of time to get there early and stress-free. – Don’t eat a large meal beforehand. If you eat a sizeable meal just before you go in, then your blood will be focused on digesting your food and assisting the digestive system. What we want instead is for the blood to circulate all over our body; from your head to your toes, and not just focused on the centre of you. – Drink a pint of water, gradually, before you enter. You can lose a pint of water after just 20-minutes into a sauna session, so you’ll want your body to keep up. A large bottle of water would be great to bring in with you, too. – Take a shower before the sauna. This falls in-between “sauna tips” and “sauna essentials” because it’s so important. Showering removes dust and dirt from your body, which clears the skins passages. It helps if you think of your body as a giant mouth; if you cover it up with clothes, it won’t be able to breathe properly. If it’s clogged full of dirt, it won’t be able to breathe properly. If you go into a sauna with your skin as clean as you can get it, the sauna will be much more effective. – Don’t take any phones or books into the sauna! The heat and humidity could fry your phone’s electronics, as well as warp the pages and spine of the unlucky book you bring in. Some saunas have an external sound system that you can use to play CD’s provided or plug your phone into, although this is less common for public saunas. – Move to suit yourself. Most saunas have benches at two different levels: one high and one low. If you want to feel even hotter, then the higher bench experiences even more heat since hot air rises. If you’re feeling a little too hot, then the lower one down tends to be the cooler. – Pour water onto the sauna rocks. Traditionally, dry saunas reach humidity levels of about 10-30%, which pales in comparison to the levels of 100% produced in steam rooms. To raise the humidity, if sauna stones are being used, you can pour water onto them. This will cause a burst of steam that changes the humidity considerably, but not the temperature. However, if you are using an infrared sauna, this will not be possible since they don’t use rocks to generate heat. Pro tip: You can add essential oils like peppermint or lavender to the water you pour onto the rocks for a richer smelling experience. Although, as oils are quite powerful, be careful to only add a couple of drops. – Leave after 20 minutes and either shower again or sit in a cooler room. 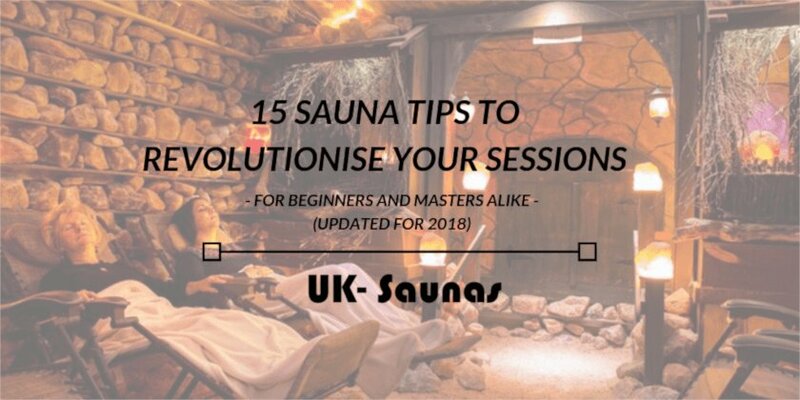 This is a matter of opinion and you don’t have to follow this to have a great experience, but we have found that leaving 20 minutes in and then returning after a 15-minute cool down is a great way to maximise our sauna experience. – Always finish with a shower. If you can handle it, a cold shower is especially effective at providing a deep level of cleaning for your body while closing over your pores, too. We’d also recommend against using soap, as it could potentially irritate your skin while your pores are still open after the sauna. Interesting fact: In Finland, where saunas are an integral part of their culture, people use to jump into the snow and roll around to cool down as soon as their session was complete. – Let your body cool before you dress again. If you’re still feeling wet or hot, putting tight clothes on will only help trap that dampness and heat. Your pores are more sensitive straight after a session, so you’ll want to avoid getting hot and sweating outside of the sauna as well. If you followed our advice and didn’t eat much before your sauna session, you might be starving at this point. Since your body would have lost a lot of salt in the sweating process, we recommend a salty treat like pistachios or pretzels. – Don’t push yourself too hard. If you’re just out of the showers and done with the sauna, it might be tempting to get straight back to working out. Instead, you’ll want to find a cool place where you can allow your body to catch up to you and gradually bring your heart rate back down. One of our favourite sauna tips. If you decided to take your sauna later on in the day, then chances are you’ll feel exhausted. If that’s the case, then you’re in for one of the best sleeps of your life. This changes with the individual, as some people just can’t handle the higher temperatures that other people might love. What we will recommend is that, for your first time in a sauna, you start off low and then build up high. There’s no shame in not being able to handle 90ºC, so take it an inch at a time and when you find the temperature that’s just right for you, you’ll know your limit and you can decide on your own “best temperature”. While the two are similar, there’s one major difference that separates the two; the saunas provide dry heat, while the steam rooms generate moist heat. Both help you relax and can open up your pores, but saunas in particular are far hotter than steam rooms. Since you feel more relaxed first thing in the morning or just before you sleep at night, it’s recommended you go during these times as this is when you will be the least stressed.